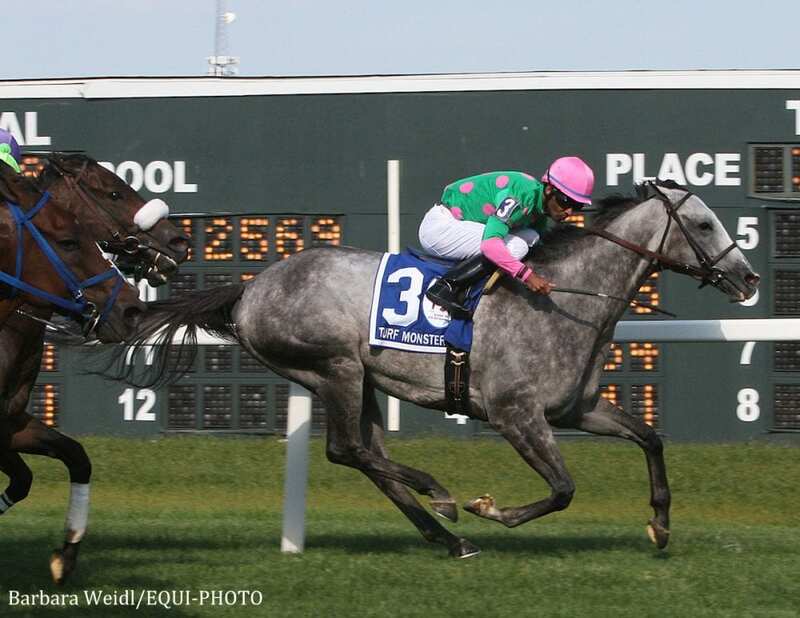 Pure Sensation ran his record to a perfect four-for-four on the Parx Racing turf course on Monday's Labor Day card, rallying up the rail late to win the Grade 3 Turf Monster Stakes for the second time in three years. The 6-year-old Zensational gelding, bred in Florida by his owner, Patricia Generazio, is trained by Christophe Clement and was ridden to victory by Kendrick Carmouche. He won by a half length, covering the five furlongs on good turf in :57, and paid $4.80 as the 7-5 favorite. Bold Thunder kept to his task, but Carmouche drove through an opening to take the lead in the final 70 yards and drew away late. Mongolian Saturday, the globe-trotting winner of the 2015 Breeders' Cup Turf Sprint at Keeneland, closed well late to get second. Pure Sensation won the 2015 Turf Monster by a nose over Mongolian Saturday, then returned to the Philadelphia track to win the last two runnings of the G3 Parx Dash, most recently on July 8, drawing off by 5 ¾ lengths, with Mongolian Saturday second and Bold Thunder third. He's now won nine of 24 career starts and earned in excess of $1.25 million. This entry was posted in Racing and tagged Christophe Clement, Kendrick Carmouche, patricia generazio, pure sensation, turf monster, Zensational by Paulick Report Staff. Bookmark the permalink.